News: The Jesse Tree ornaments featured on this page in 2009 have been retired. Instead, you can find updated (and larger!) 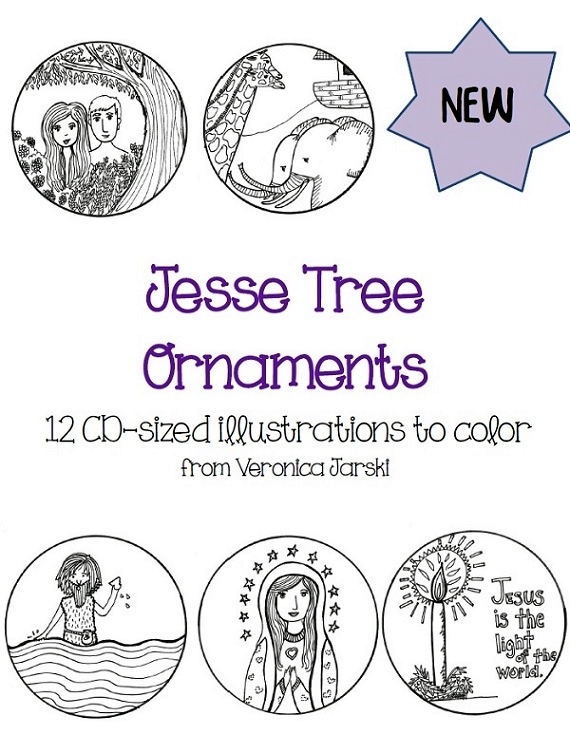 Jesse Tree ornaments in the special Advent section of my Etsy shop. You can find the Jesse Tree collection here. I still can't believe we are so close to Advent. Thank you! I plan to use these with my RE students! Thank you for your generosity in sharing this! Thanks for the comment. And how neat to think of my work shared with RE students. I've a special place in my heart for catechists and pray for you all regularly. Peace & blessings! God bless you Veronica! I have been looking for great Jesse Tree ornaments for 2 years and never found something that sung in my heart. These are beautiful and I cannot wait to color them and explore your site some more. Thanks so much for sharing your art. Thanks! I know how the hunt for the right Jesse tree ornaments can be ... I struggled to find something that just worked for us, and then, hee, decided to do my own. Now, it's more of our style. And with the Scripture verse number beneath it, I don't have to juggle papers. Hmmm. Maybe next year, though, I'll have the verse winding around the ornament ... Hmmm. I just wanted to let you know how much I love your ornaments. I am using them with my CCD class - God Bless you and your family. Awww, thank you! I am so glad to hear they are being used at CCD. I've a huge, huge soft spot in my heart for CCD teachers. Please know we always pray for them and their students! Peace and blessings! Very cute. I made felt Jesse Tree ornaments last year and these are a good match for the kids to color as we put up the felt ornaments. I did have to shrink to fit printable area to get the whole image to print out on the page without cutting off part of the circles. And, yes, actually, all my Paper Dali figures and doodles require the settings to be "Fit to Printable Page." These are beautiful!! We will use these with a green paper kid hand tree on the wall or door! New to your site (from Catholic Icing). This will be our first Jesse Tree. I am excited to color and teach our littles. I just printed these out, they look fantastic! Thank you for sharing your talent, my children will love these and I appreciate how simple it is! Love these ornaments! Thank you so much for sharing this with us all. Oh, and I love Jamie Jo's idea of using these with a tree made from kids' hand cutouts. Brilliant! Jamie Jo: Welcome! And I really like your handprint tree idea. Tina: Howdy! Glad you like them. Thanks for stopping by. Theresa: Yep, I'm all about simple crafts. : ) You're welcome. Have fun! Kelly: Hello, there! Thanks for visiting from Lacy's place. You're welcome. I hope they come in handy. If anyone feels like sharing a pic when they're done, do feel free to email me or post here and let me know! I'd love to see the finished product. Thanks so much Vee! These are amazing, which is no shocker with you! I can't wait to color them! Thanks so much for making these available to us! I making a Jesse Tree set for a friend and love your hand drawn ornaments! 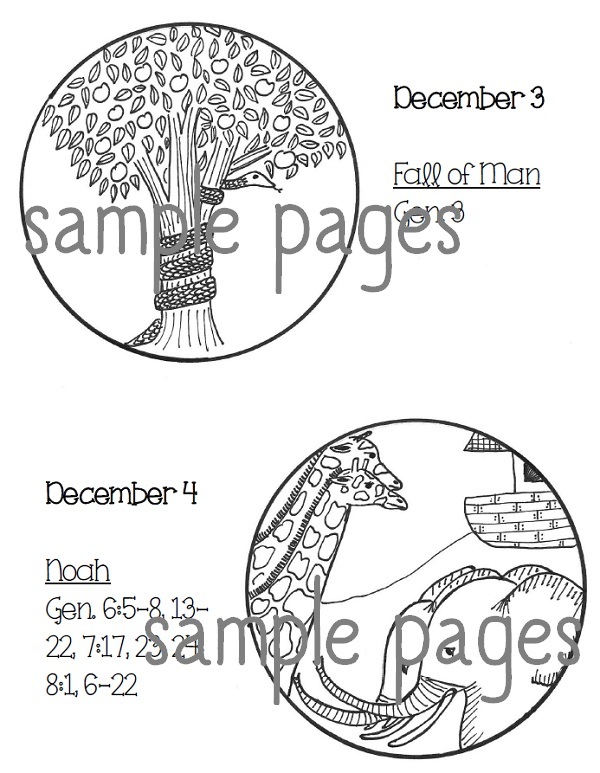 I'm going to color them and have them laminated with the Scripture verse on the back! Thank you a gazillion times over!I We've never done a Jesse tree before so this should come in really handy. We will definitely be using these this year---thanks for sharing. I love the scriptures and the drawings. God Bless! I had all intentions (as I have the last few years) to make ornaments myself with my kids. What a blessing you provided for me to print these off for my kiddos instead. Thank you so much! 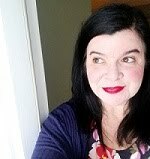 Hi I've just begun to follow your blog, I'm creative in my mind but rubbish at executing crafts in reality! This Jesse tree symbols are great cos they solve my problem. Thanks so much for sharing your beautiful artwork! This is exactly what I was looking for. I can't wait to share them with my CCD kids. God Bless! Vee, I am new at the Sunday School gig, and just ran into your illustrations for the Jesse Tree and they are wonderful. Thank you for putting them out there for others to use. Our kids at church will love them and I love having found something that resolves my quest to find something unique. 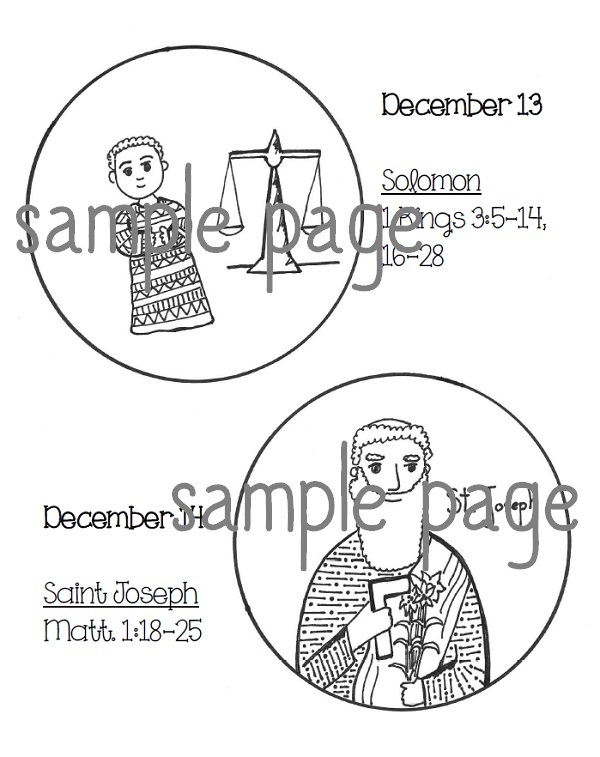 My daughter is off to begin coloring this set for us to use this Advent. Each year (lately) we've colored a new set, but this is the first year I've seen yours. I like streamlined, too. Thanks for offering these. Sounded like a lovely project. Hope you had fun. Send a photo if you've the chance! Thanks for the kind words. God bless you, too. It's easy to come up with stuff, I know, but the hard part is settling down to do it. Eek. Hope it was a good project. You're very welcome. Hope the CCD kids had fun with the project ... and learned, too. Thanks for taking the time to comment. I had problems finding exactly what I wanted, too, so I just ended up drawing them. :) Glad others could benefit, too. Have a lovely time. And send a photo if you can. Oh, how very nice! Hope she has a fun time coloring. (I love coloring, too!) Enjoy! These ornaments are beautiful. I will be using them with my two kids this year during Advent. Thanks for sharing your talents with the rest of us! What is the second verse listed on the ornament "Jesus is the King of the Gentiles"? It looks like it might be Ephesians. Thanks!! Thank You! Thank You! I have looked and looked for a couple of years for simple symbols that my third grade students could easily color. I look forward to using these in my classroom this year. I found these symbols through Catholic Icing, and I am sooo grateful! I've always been overwhelmed by other Jesse Tree projects. I am an extremely busy mom and knew the other projects would never get done. THIS I can do. Thanks! Hi there! I found your site while searching for printable Jesse Tree ornaments to color, and I like yours better than any others that I've found, so I'm printing them off right now. Thank you so much for making these available to us! It's December 1st and I'm just a little behind (or maybe right on time)! But I wanted to print off some ornaments and I love yours because it gives the kids something to color. This is the first year we'll be doing the Jesse Tree. Thank you! It's December 1st and I'm a little behind (or maybe I could say I'm right on time). We're starting the Jesse Tree for the first time this year and I love that the kids can color these ornaments. Thank you! De nada! Viva Cristo Rey! I'm all about simple drawings here at Paper Dali. :) Glad you enjoyed them! Send me a photo if you've the chance! Totally understand the extremely busy mom! Glad you found Paper Dali. Have fun, breathe deeply, and color with the kids. Coloring does wonders for the busy mom. Really! Thanks so much. How sweet of you to take the time to comment. Enjoy! Hee! It's never too late to work on the Jesse tree ornaments. Have fun! Peace be with you. Glad you like them. You're very welcome! Peace and blessings to all who have taken the time to comment. I just purchased these on Etsy and love them! It is so nice to color again! Who knew it could be so cathartic around these stressful holidays? Thank you for making it easy for me to finally do a Jesse tree in my home. Thanks to Catholic Icing for sharing! Oh, I'm so happy to hear that. And hooray for coloring! I've always found something very relaxing and comforting about coloring. Glad it was for you, too. Thank you so much. These are beautiful. I was really looking for ornaments that included the O Antiphons. I would be interested in knowing if you ever expand your ornaments to cover all the possible days of Advent, since it can range from 22 to 28 days in any given year.